Farmhouse sinks, whose style harkens back to the 19th century, are enjoying a revival, with more models being offered than ever before. Farmhouse sinks, also known as apron-front sinks, are a country kitchen staple. These distinctive vessels have an exposed front that sits above, not behind, the base cabinet. 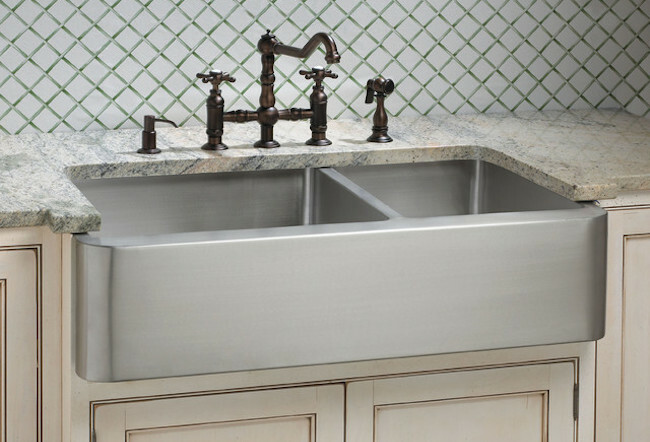 Common in early 19th-century kitchens, the farmhouse sink has enjoyed renewed popularity over the past decade, which has spurred manufacturers to offer a greater range of models, materials, and options than ever before. The popularity of farmhouse sinks isn’t just a matter of aesthetics. Their deep basin comfortably accommodates large pans and helps cut down on splashes. Because the sink sits far forward, the user doesn’t need to bend down as much. And thanks to the style’s appeal, apron-front sinks now come in both single- and double-bowl models with a range of options. On the downside, these sinks have a higher price tag and less selection than the more common drop-in styles. Because of their shape and considerable weight, they usually require additional support and a specially designed base cabinet. But this situation is changing: Due to such innovations as shallower bowls and overmount designs, it’s easier than ever to retrofit an apron-front sink. In addition, the introduction of clean-lined stainless steel models has made this highly coveted style appropriate for even sleekly modern interiors, with nary a cow in sight. Are you in need of a Chicago Sink Refinishing expert?